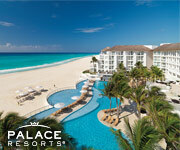 ORLANDO, FL--(Marketwired - October 08, 2013) - Southwest Airlines Vacations is offering travelers $150 in savings when booking Palace Resorts vacation packages. Plus, travelers can get additional hotel savings including up to $1,500 resort credit, a free room upgrade, and VIP amenities. Travelers who book a flight plus Palace Resorts vacation package of five nights or more with Southwest Vacations, will save $150 when using the promotion code PALACE150 at the time of booking. Plus, guests can get up to $1,500 resort credit, a free room upgrade, and VIP amenities. To take advantage of this Palace Resorts vacation deal, travelers must book their packages between October 1, 2013 and October 14, 2013 by 6:00 p.m. Central Time for travel October 2, 2013 through April 6, 2014. One-day advance purchase is required. Restrictions may apply. $150 promotion code savings apply on flight plus Palace Resorts hotel vacation packages of five nights or more at any Palace Resorts property that Southwest Vacations offers. Savings is reflected in the package price when using promotion code PALACE150 at the time of booking. Length of stay for flight and hotel components must match. Promotion code intended for redemption by individual consumer only. Savings valid if booked October 1, 2013 through October 14, 2013 by 6:00 p.m. CT for travel October 2, 2013 through April 6, 2014.